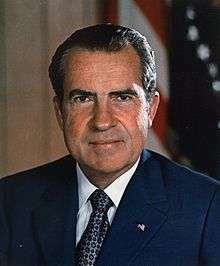 Before the National Archives took over its management, the Nixon Library had been accused by several media outlets of glossing over Nixon's 1974 resignation with "whitewashed" exhibits. In 2007, the National Archives removed the 17 year old Watergate exhibit and, after three years, the new exhibit was scheduled to open in July 2010. The Nixon Foundation objected to the proposed exhibit, because the Nixon Foundation was not consulted in the way that other presidential foundations had been consulted with similar situations. The Foundation filed a 158 page memorandum to the Assistant Archivist for Presidential Libraries expressing their dissatisfaction and NARA stated a committee would review the objection but gave no timeline for when that process would be concluded. The exhibit opened on March 31, 2011. 1 2 3 Flaccus, Gillian (July 12, 2007). "Federal Archivists Take Control of Nixon Library". The Associated Press. The Washington Post. Retrieved 2011-10-09. ↑ "Nixon Foundation finds new leader in William Baribault". The Orange County Register. June 18, 2014. Retrieved 2014-06-18. 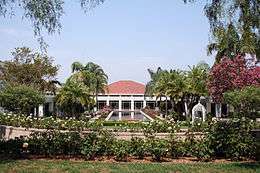 1 2 "Nixon Library and Birthplace Marks Anniversary: 1990-2010". Richard Nixon Foundation (Press release). PR Newswire. July 15, 2010. Retrieved 2011-10-09. ↑ Michael Mello (September 14, 2011). "Justice courts Nixon library crowd". The Orange County Register. Retrieved 2011-10-09. ↑ Jebb Harris (August 16, 2011). "Richard Nixon's brother plays the president". The Orange County Register. Retrieved 2011-10-09. ↑ "16 Tons Of World Trade Center Wreckage To Act As Centerpiece Of 9/11 Tribute At Nixon Library". CBS2/KCAL9 News. September 4, 2011. Retrieved 2011-01-09. ↑ Walker, Ronald H. (August 2, 2010). "Memorandum for Sharon Fawcett, Assistant Archivist, Office of Presidential Libraries, National Archives and Records Administration" (PDF). National Archives and Records Administration. Retrieved 2011-11-06. ↑ "Watergate Becomes Sore Point at Nixon Library", by Adam Nagourney, The New York Times, August 6, 2010 (August 7, 2010 p. A1 NY ed.). Retrieved 2010-08-16. ↑ Terrell, Jessica. Editorial weighs in on Nixon exhibit controversy, The Orange County Register, August 11, 2010. ↑ "Nixon Library Opens a Door Some Would Prefer Left Closed", by Adam Nagourney, "The New York Times", March 31, 2011 (April 1, 2011 p.A19 NY ed.). Retrieved 2011-04-01.